We’d love your help. 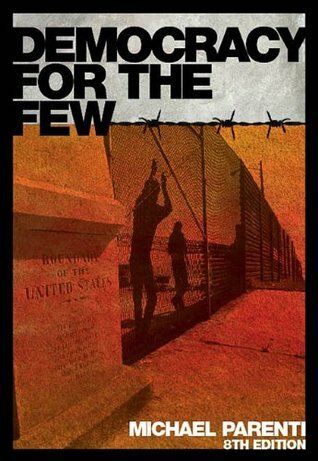 Let us know what’s wrong with this preview of Democracy for the Few by Michael Parenti. To ask other readers questions about Democracy for the Few, please sign up. Hello! Any brief summaries on this book? In the wake of the 9/11 attack, Bush Jr. issued a host of executive orders supposedly to enhance national security, one of which rescinded certain labor protections required of federal contractors. When a federal court revoked Bush’s decision, the president ignored the court decision, justifying his action as a response to “national emergency.” Executive Order 11000 allows the government to mobilize civilians into work brigades under government supervision; 11002 designates the Postmaster General to operate a national registration of all persons; and 11004 allows the government to designate residential areas to be abandoned and move whole populations to new locations. Still no mention of those executive orders, but this is when Bush declared a state of emergency (mentioned in the quoted paragraph from the book) which would allow him to use the powers in those orders. So, a rebuttal to me might be that even though that was all one paragraph, I the reader misconstrued what the author meant and he never technically stated that Bush was the ones who is responsible for those orders. Okay I disagree with that but I can see where someone would be coming from if they made that argument. So let’s move on to an example which still has an active webpage and which was the one that originally set off my spider sense. The Internet also offers progressive websites that provide information and opinion rarely accommodated by mainstream media. By its nature the Internet provides for individual transmission and commentary by just about anyone who has a computer and an opinion, bringing us some of the best and worst, but also providing new opportunities for networking and organizing, and for gathering information. Some giant telephone and cable companies began pressuring Congress to limit the number of Internet servers, in an effort to establish high-fee monopoly control. Their goal has been to create the electronic equivalent of an expensive“fast lane,” while relegating all nonpaying users to slower, more limited, and less reliable access. Now, I'm pro-Net Neautrality and had obviously heard about, and been worried about, internet "fast lanes" but this was the first I had heard of the telecoms trying to get Congress to limit the number of internet servers. So I couldn't wrap my head around this one. Not just why I hadn't heard about this before, which would be understandable, but I couldn't understand whose internet servers he was talking about. So I checked out the reference for this one (http://civic.moveon.org/save_the_inte...) and found that the source is a call-to-action from MoveOn to contact your representatives to support net neutrality but it never mentions anything about limiting servers. So since I am reading the 2011 edition I thought that maybe the information on the page has changed since he used it. Using Internet Archive's Wayback Machine I looked at a copy from 2008 ( https://web.archive.org/web/200808272... ) and found that although there are small wording differences, it still makes no reference to limiting servers (which I still don't understand whose servers he's talking about. The telecoms? If so why didn't they just limit them instead of going to Congress). So for this example I still won't say that I am 100% sure he is wrong, partially because I may have missed something and partially because I may be misunderstanding what he is saying, but here is an example where I know he was incorrect. Almost all contracts are awarded at whatever price a corporation sets without competitive bidding. That means the defense firm can name its own price and the Pentagon pays up. And despite repeated pledges to reform the process, non-competitive contracts are a hard habit to break. According to federal data, the Pentagon’s competed contracts, based on dollar figures, fell to 55 percent in the first two quarters of 2011, a number lower than any point in the last 10 years since the terrorist attacks of 9/11. In fiscal year 2013, the Department of Defense (DOD) awarded contracts for about $308 billion for products and services, of which 43 percent was awarded without competition. In addition, DOD accounted for over 80 percent of government-wide obligations that used noncompetitive contracts. further debunking the claim that “almost all” military contracts are no-bid. To be honest I did not fact check everything he wrote nor do I plan to, so this list is not comprehensive. It was only a few items I found extremely interesting or thought were incorrect that I went on to read more about elsewhere. That is not to say I think the book is full of incorrect data or assertions and if I had to make a guess, I would say that the majority of the book is true based on the fact that I have seen much of these same claims in other sources. Still these few issues completely ruined the book for me, which up until the point that I noticed them, I had thought I was going to rate the book 5 stars. I mean it really is an extremely engaging book in my opinion, I loved Parenti’s writing style, and I believe his overall thesis is correct. Some people might dislike it because it is not “unbiased” (code for an ideology different from their own), but I think this is perfectly acceptable especially when you take into consideration the fact that most of the news and history books we are exposed to is extremely pro-capitalist, pro-federal government, pro-expansionism, etc, without any mention that there might be a different side to the story. Still, I think a 1 star rating is justified since these errors made me question everything else I learned from the book. I decided not to finish reading this book. While most of the author's statements may be true, he refers to the CIA being involved in the JFK assassination, says there are "questions about" 9/11, and other occasional points which made me uncertain which statements I could rely on. The book has lots of footnotes - if you're inclined to try to use the footnotes to help you decide which "facts" are well founded, you might find useful data here. Even if one accepts the above "conspiracy theories," I w I decided not to finish reading this book. While most of the author's statements may be true, he refers to the CIA being involved in the JFK assassination, says there are "questions about" 9/11, and other occasional points which made me uncertain which statements I could rely on. The book has lots of footnotes - if you're inclined to try to use the footnotes to help you decide which "facts" are well founded, you might find useful data here. Even if one accepts the above "conspiracy theories," I would think there was enough other data supporting the general thesis of the book that you would convince more people if you left out these assertions. So, I have less confidence in the author's choices. Depicting the portrait of the corporate US versus citizens, the book is full of examples of when vested interests of big oligopolists dominated over the Congress and public laws. Election system is established in a way through which only wealthy candidates can penetrate, thus ruling out the representation of the interests and needs of the impoverished in the government. For the protection of the overseas business interests, US backed authoritarian states and dictators from time to time. Wars aga Depicting the portrait of the corporate US versus citizens, the book is full of examples of when vested interests of big oligopolists dominated over the Congress and public laws. Election system is established in a way through which only wealthy candidates can penetrate, thus ruling out the representation of the interests and needs of the impoverished in the government. For the protection of the overseas business interests, US backed authoritarian states and dictators from time to time. Wars against other states served corporate interests under the disguise of protection of national interests. All the while, media magnats served to be a tool to form public opinion based on the state propaganda, alienating alternative opinion. Fines and prison terms can be very harsh for petty crimes such as shoplifting, illegal drug use and pickpocketing, meanwhile big corporate criminals go along with dumping toxic chemicals to the environment and water resources, sometimes being imposed to a ridiculously small amount of fine and/or short prison terms. Environmental-friendly public transport has not been developed due to the profit interests of oil companies. Budget of social programs and scientific research is trimmed and trimmed, meanwhile military budget gets generous shares. Interpretation of the constitution and laws for the favour of the wealthy by the judges is not a rare occurrence. Discrimination against women and blacks is still prevalent. In the light of strong representation of the economic interests of the few, reactionaries argue that civil society and public outcry is not effective. "Democracy for the Few" provides a set of examples to disprove the previous argument, naming evidences when civil society has been effective in pushing for positive environmental, political and economic changes. US in many ways possesses far more developed economy than many countries in the world; however, this book opens an entirely different vantage point for the readers to observe what invisible struggles are going on behind the glittery economic and political power. It is an eye opener for those who are not aware of the other side of the economic power of the US. It also shows the inordinate similarity of the rule of the opulent segment over the political will in the US and most, if not all, authoritarian states in the world, including mine. This is a stinging critique of America from a left-leaning analyst which includes a surprising number of smart non-partisan recommendations. Parenti is also a significant non-partisan reformer, although he wanders into traditionally socialist territory when he examines themes like wealth inequality. After decades of Republican rule, he notes that the top 10% of households own 98% of state and local tax-exempt bonds, and when wealth is distorted to this extent, it's difficult for democracy to fun This is a stinging critique of America from a left-leaning analyst which includes a surprising number of smart non-partisan recommendations. Parenti is also a significant non-partisan reformer, although he wanders into traditionally socialist territory when he examines themes like wealth inequality. After decades of Republican rule, he notes that the top 10% of households own 98% of state and local tax-exempt bonds, and when wealth is distorted to this extent, it's difficult for democracy to function effectively. Too few people have too much power. The really rich, he argues, have a "predominant voice in the highest councils of government", and I agree that this distorts democracy. He has a valid point. I think America shifts between capitalist and socialist orientations every generation or so which serves as a healthy brake on our republic. With the recent election of a Democratic president, we've again shifted left and there's widespread relief that the system will correct itself. But can it? Parenti's observations click with mine and suggest that America's problems are deeper, systemic, structural. He describes how much congressional activity is secret. There is excessive concentration of power in the executive -- the president has tremendous power to control media coverage and often controls the most information in any policy area, and can act in a way Congress can't. Parenti says that "executive privilege" was never written into the Constitution. He thinks partisan politics is out of control, and has a long list of sensible reforms such as term limits for judges, more subsidized airtime for candidates, public financing for elections, scheduling elections on weekends not just weekdays, caps on election spending, and easier ballot access for third parties. His moderate left-leaning suggestions include making the income tax more progressive. But I think America's woes are greater than Parenti says, and that a solution won't come from lots of little reforms, a change of presidents, a shift from right to left, a change of parties, amendments to the Constitution, and so forth. I think the political process is broken. The federal system has broken down so that individual states no longer manage their own economies; Washington does, and it does this job badly. Further, people are no longer real citizens who participate in local government; rather, we've become consumers, investors, workers, political zombies who are thoroughly apathetic and powerless. What I find particularly dangerous is that the nation lacks an adequate strategy to prevent terrorism. We can't prevent terrorism given our current structure. For me, this is proof that America's political process is broken and a clear sign that inaction is more dangerous than action. Therefore, I think the only solution to fix America is to reform the American political structure. This, in my view, requires a Second Constitutional Convention. I've summoned over 100 of the nation's best thinkers from across the political spectrum to convene in Independence Hall in Philadelphia beginning July 4th, 2009, and I hope they will craft a revised document based on the existing Constitution which (1) prevents crime, tyranny, and foreign terrorism (2) identifies movement in public to thwart terrorism while strenthening privacy (3) restores the federal structure so state governments regain their rightful authority to manage their respective economies (let partisans compete at the state level) (4) redefines citizenship as an active contractual relation between individual and state with specific responsibilites and privileges (5) fixes the architecture of government to permit long-range and intelligent foreign policy (6) restores the checks and balances between branches of government (7) de-politicizes the Supreme Court and (8) restores a healthy democratic process. I think most people and experts mistake terrorism as only a government and military and police problem. I think the problem of terrorism is bigger -- it's a citizens' problem. We suffer when it happens. So citizens need to prevent it. And as citizens we have wider latitude and authority to act than government officials have, that is, as citizens, we can reform the structure while preserving our rights and freedom while enabling officials to prevent terrorism. But this requires a new understanding of terrorism. My book "Common Sense II: How to Prevent the Three Types of Terrorism" (Amazon & Kindle, 184 pages) spells out the logic for a prevention strategy. The essential concept linking an effort to prevent each type of terrorism is the application of light (meaning information, exposure, awareness.) For example, to prevent crime, we must identify all movement in public while strengthening privacy. For this to happen, citizens must agree to such monitoring, and for this to happen, people must become real citizens, not merely apathetic consumers and shoppers which characterize most Americans today. The concept of citizenship is examined (again, a type of light); citizenship should be a contract between individual and state with specific responsibilities and privileges. It's possible to prevent every instance of home-grown terrorism using this method. The rest of my book shows how one can apply the concept of light to exposing the other types. For example, I think the architecture of government requires an overhaul so that America's foreign policy consistently rewards friends and consistently punishes enemies; but today it can't do this because administrations change every eight years, sometimes after only four. I propose a revised architecture based on history and political philosophy. My strategy will prevent all types of terrorism, including smuggled nuclear bombs. It's brief, rational, non-religious, written by a citizen for citizens, non-technical, non-partisan. Be prepared: there are some controversial ideas (one expert found it "bracing"). But my book can protect America. It's plain logic from one citizen to another. If a Constitutional Convention is impractical politically, then Parenti's suggestions for reform are intelligent and practical. Parenti's book is an on-target critique of America which, in my view, tends to look at the problem through the viewpoint of a moderate left-leaning reformer, while I think America's woes are so severe that only serious, substantial non-partisan, centrist reform will save us. Highly recommend everyone to read this a big eye opener! In the beginning of my education I had rated this lower in review primarily due to my lack of knowledge of the social and political implications on the expansion of Marxism's economic theories. However my opinion shifted towards the true ramifications of the hegemonic system that we are sadly bound by. Please keep an open mind while reading. I say this because the tendency to fall into that rhetorical trap of "not enough hard work" can be imbedded within the subconscious through past influence. Terrific and depressing at the same time. I had the same experience reading this that I had reading People's History of the United States by Howard Zinn... the feeling that "that is how I always suspected things worked, and this is confirmation." My only critique is that, like People's History, the facts become overwhelming after a while and it's almost like reading a really long list of everything that's wrong with our system. However, I'd still highly recommend this work to any iconoclast. of course the title is sarcastically pessimist, it's talking about USA - how do you know the president elected is the one the majority wants - and, how do anyone know she's the best for the country even though for sure the majority wants her? the latter is for Indonesians who smugly said yes to the first because we don't have to deal with these electoral colleges. I can't believe this is a textbook. Cherry-picked statistics, half truths, and loaded language make it close to impossible to take Parenti seriously, which is a shame because he has some good ideas. Wikipedia is used as a source numerous times; this is not a work of academia, and certainly not worth the $90 price tag. Interesting read, some parts were gravely exaggerated or some connections were made that weren't entirely accurate. But the general gist of the book provided an efficient critical analysis of the American government. If you don't think that the democratic system in the US is working the way it ought to, but aren't sure exactly why, this book is a great starting point. It is short enough and written in a non-academic style, ez to digest. Unfortunately some chapters can be a bit repetitive. I'm slowly reading through this book and knowing it was written in the 70's , much of what I've read so far still rings true today. The author of this book has got it spot on with his research of history and on the delusion known as democracy in America. If you're a diehard republican that believes George W. Bush can do no wrong, don't bother with this. However if you are able to read and discuss topics that oppose your interests without significant blood pressure medication this is a book you want to read. An excellent introductory critique and perhaps one of Michael Parenti's finest works, dispelling the myth that democracy in America works for all. It has some disturbing examples and statistics that demonstrate clearly how social class in America works, underlining the importance of power. This rating is based on my awful experience trying to choke this book down for intro poli sci in my first semester of college. However, much has changed in 10 years, so if I ever dare to try it again, it may very well deserve a higher rating. This book covers practically every relevant political issue in the US. It is a great intro to politics book. Anybody who wants to understand what America really is needs to read this book. EVERYONE should read this book. it was insightful and easy to read. this guy writes soooo much better than noam chomsky. This book started me looking at the Progressive Movement way back in college. Read all Michael Parenti books. mostly regarding the domestic situation in the US (some brief comments on US foreign policy & empire). intended as a textbook for undergraduates. A very insightful look into the Government. I thought it was a great read and funny at the same time!!! Surprisingly interesting, if you can stand the usual statistics that over such academic sociological books are drenched in. Recommended. American political scientist, historian and culture critic. Parenti is most known for his criticism of capitalism and American foreign policy. He holds a doctorate from Yale University.